Para-swimmers have been given top tips on how improve their skills in and out of the pool during a ‘successful’ development day. The event, staged at the Plymouth Life Centre, gave clubs, coaches and athletes the chance to take part in training workshops and learn more about the Swim England Para-swimming Talent Programme. It was the second development day organised by the South West region and plans are already being put into place to host another in the near future. Martin Lees, Swim England para-swimming development manager, said: “The development day was a huge success. 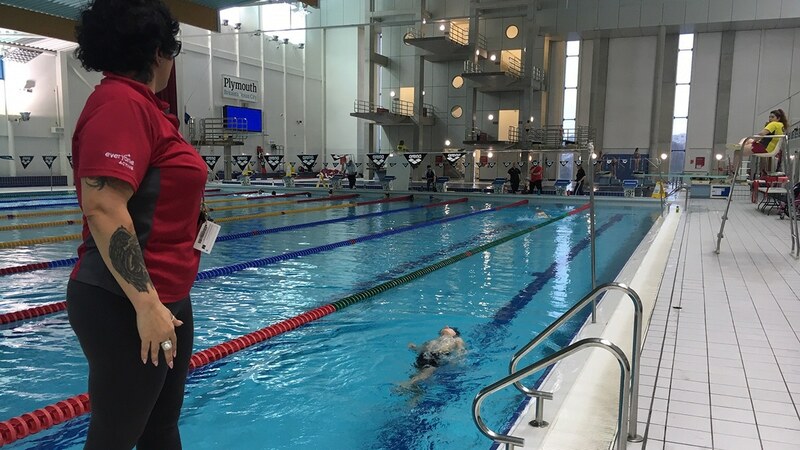 Former Paralympic swimmer David Hill, who made his Paralympic debut in Athens at the age of 15, gave advice and guidance to athletes and coaches at the event. David, who works closely with the Swim England Para-swimming Talent team, said: “I’m passionate to ensure that athletes who reside in the South West have access to the provision of high-quality coaching and resources without being farmed out of the area. Events at the development day included a land training workshop to help improve athletes’ movement patterns, before swimmers went into the pool to test out what they had learned. Sam Towers, the secretary of South West Para-swimming Committee, was impressed with the session. Stephanie Gabb, who recently started as the Club Development Officer for the South West, spoke to clubs and para-swimmers during the day – and said the event had helped strengthen para-swimming in the region. She also helped with the swimmer ID session, where 13 new swimmers were identified for the Swim England Para-swimming Talent Programme and another four signed off to go on the classification waiting list. Stephanie said: “It was fantastic to see so many coaches and athletes here – there seems to be a real appetite from the clubs to learn more about para swimming. Simone Cater, a coach at Dinnaton SC, also found the development day helpful. Plans are now in place to stage another development day in the South West region and anyone interested in attending, or finding out more about para-swimming, should email the Swim England para-swimming team. Meanwhile, there is still time to enter the South West Regional Para-championships on Saturday 9 March at Horfield Leisure Centre. The closing date for entry is Friday 22 February.